Automated blinds integrated with the operable windows maximize daylight and minimize glare on workstations. 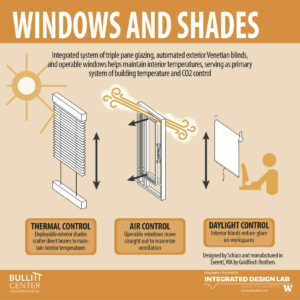 Integrated system of triple-pane glazing and deployable exterior shades helps maintain interior temps. Operable windows move straight out to maximize ventilation. Windows designed by Shuco and manufactured by Goldfinch Brothers in Everett, WA. A very important part of a Living Building is a living “skin”; a selective filter that responds to the ambient environment to maintain comfortable conditions inside the building. 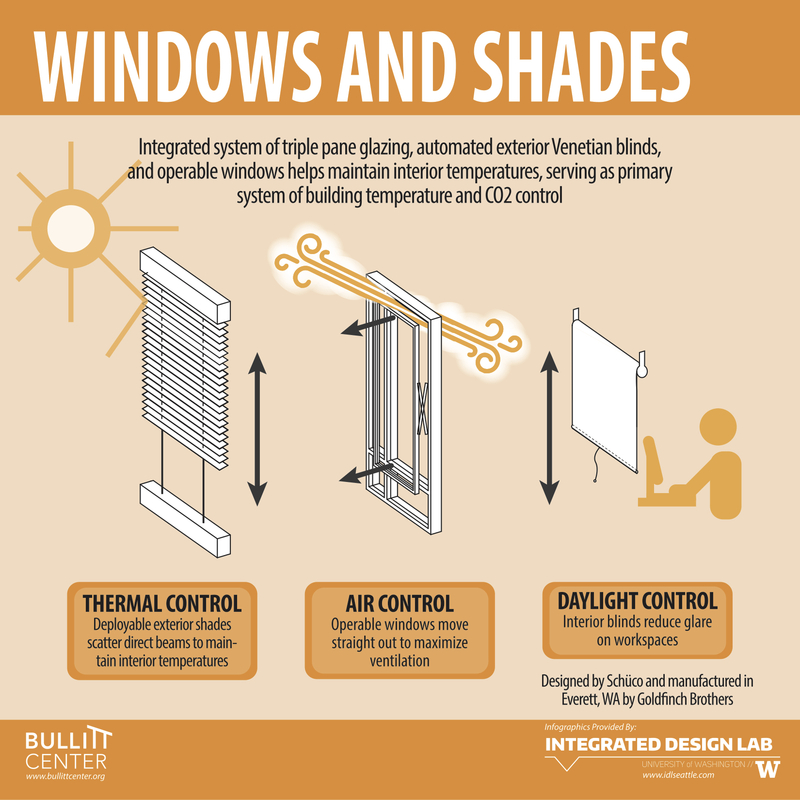 In the case of the Bullitt Center, the windows and shading systems do the bulk of the work for the daylighting and ventilation, as well as assisting in the thermal comfort of the building. The skin is a system of layers that are used in different combinations to achieve optimal thermal and daylight qualities. The outermost layer of the skin is the deployable stainless steel shades. Designed by Warema, the system sits about 12 inches away from the windows. In the summer, when solar heat gain can be a challenge, the shades deploy to scatter direct rays before they hit the glass. In the winter, the shades are designed to maximize natural daylight in the office spaces, while still protecting against direct glare on workstations. Such a high performing building also needs high performing windows. The windows the design team identified are produced by Schuco, a German company. But transporting windows from Germany to Seattle significantly reduced any environmental benefit of the choice. Luckily Goldfinch Brothers, a 120-year old family owned company in Everett, WA was able to connect the design team with Schuco. Today, Goldfinch is the exclusive manufacturer of the Schuco System in the western United States. Each window unit weighs 532 pounds and is specifically designed to eliminate thermal bridging between the interior and exterior. Two inches and three panes of glass keep the hot air out and cool air in during the hot summer days, and the cold air out and warm air in during the cold winter days. When the conditions are right, these windows can push straight out, drawing in air from all sides around the window pane.